These custom 4x6 inch square corner dog boarding magnets – 20 MIL are an ideal way to build trust around your dog boarding services. It is well suited for all types of pet services, animal breeders and many others. Gifting away this magnet is an ideal way of positioning your cause or business before others. 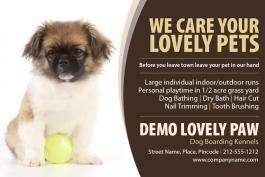 Attractive price benefits can be availed on bulk ordering this customized dog boarding magnets- 20 MIL. Perfect for gifting on regular business days, pet shows or it makes a great pet awareness month giveaway, too. Request a quote to know bulk order discounts for these customized 4x6 inch square corner dog boarding magnets – 20 MIL.